Air Force Major Margaret Witt (Ret.) sued the Military over Don’t Ask Don’t Tell, which prohibited discrimination against closeted homosexuals but barred openly gay, lesbian, trans or bisexual individuals from service. Her decision to confront the 17 year policy helped overturn the military’s treatment of gays and lesbians and ushered in a new era of acceptance.. This era of tolerance is being challenged by President Trump’s attempt to stop trans people from serving. 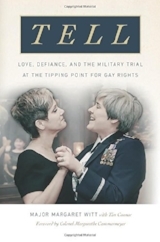 Her book is “Tell: Love Defiance and The Military Trial At The Tipping Point for Gay Rights.” Co-authored with journalist Tim Connor. She appears September 26th at The Museum of Flight in Seattle at 7:30, presented by Town Hall Seattle and The Museum of Flight. Over Skype, I talked to Major Margaret Witt, the Tacoma native and decorated air force frontline nurse, about her long battle to be treated as full-fledged member of the service, worthy of her rank and her commitment. Lieutenant Frederick Gotthold Enslin served with honor under George Washington at Valley Forge. But in 1778, Enslin was drummed out of the military. His crime? He was homosexual. He wouldn’t be the last. For many years, gay, lesbian and transgendered Americans were deemed by the military to be unfit for service. Over one hundred thousand service members had been discharged for being gay by 1994, when Congress crafted the unwieldy compromise of Don’t Ask Don’t Tell. It didn’t end the expulsions. For the 17 years DADT was in place, more than 13,000 members of the air force, coast guard, army, navy and marines, were removed from military service for their sexual orientation. Don’t Ask Don’t Tell was overturned by the courts due in large measure to the decision by Reserve Air Force Major Margaret Witt to fight her discharge. Over the last few years, the debate in America over the rights of people of different gender identities has become a key civil rights issue. Professor Marieka Klawitter is the final speaker in the UW’s Equity and Difference series. Her widely published research, focuses on poverty, family savings and the economic impact of public policies on sexual orientation. Her May 18th lecture, “I’m Coming Out: Sexual Orientation and Gender Identity in the U.S.” looked at the ways acceptance and changes to the law have affected LGBTQ equality since the 1969 stonewall riots. We met at her UW office to talk about the social and economic realities for members of the LGBTQ community. Professor Marieka Klawitter was the final speaker for the Equity and Difference series at the UW. Support for At length comes from the Office of the President of the University of Washington. You can hear all the interviews from this lecture series, and previous series. Our homepage is At Length with Steve Scher. Hear the interviews on Itunes, and Stitcher. School reform could succeed in the U.S. if the cultural paradigm is flipped and urban schools led by strong leadership among principals, community activists and students are acknowledged as leaders in promoting quality education. University of Chicago scholar Dr. Charles M. Payne talks with Steve Scher about real reform. America continues to grapple providing quality education for every child. There are great schools. There are failing schools. There are successful teachers and not so successful ones. There are effective principals, community activists, students and some that are not so effective. The United States spends millions on schools, invests millions of hours in efforts at school reform, all in search of some universal formula. Since The Supreme court ruled in Brown vs. The Board of Education, the race of students and communities has gradually become secondary in these discussions of reform. Instead, the focus has shifted broader social, economic and, political factors. But perhaps, scholar Charles M. Payne argues, the realities of race should return to the forefront of this discussion- not to be seen as a problem to overcome, but as a dynamic for empowerment. Dr. Charles M. Payne studies the failures and sometimes the successes of reform efforts in schools. One of his recent books, “So Much Reform, So Little Change,” looked at the history of American education reform efforts, arguing that policy rarely reflects the real attitudes of people in urban school districts. Charles M. Payne is the Frank P. Hixon Distinguished Service Professor in the School of Social Service Administration at the University of Chicago, where he is also an affiliate of the Urban Education Institute. Professor Payne is among the founders of the Education for Liberation Network, encouraging young people to think critically about social issues and their capacity for addressing them. Dr. Payne's Seattle talk was sponsored by the UW Graduate School, the University Alumni Association, as well as a number of other departments and programs at the UW. The next talk in the Equity and Difference Public Lecture Series will be in Seattle April 5 at Kane Hall on the UW campus. Registration is open. Find this podcast at our homepage, Itunes, Stitcher and other networks. Search for At Length with Steve Scher. Share your thoughts, comments, reactions with me. atlengthwithstevescher@gmail.com Thank you for listening. Why aren't Indians often heard in mainstream America? Scholar K. Tsianina Lomawaima says it’s because of the simple but challenging reality that this country is built on Native lands. The recipient of the UW Distinguished Teaching Award talks to Steve Scher about American Indians, citizenship, identity and strength. She is professor, Justice and Social Inquiry, Distinguished Scholar of Indigenous Education, Center for Indian Education, School of Social Transformation, Arizona State University. Can an honest exploration of the Holocaust be a starting place for Jewish and Muslim reconciliation? Ralina Joseph "What's the Difference with 'Difference'"
Welcome to At Length, our second season of conversations where we take a little more time and delve a little deeper into the profound issues of our era. Her talk is about the power of language to open or close doors to equity and opportunity. On the mission statement page of the website of the Center For Communication Difference and Equity is a quote from American scholar and poet Audre Lorde, “It is not our differences that divide us. It is our inability to recognize, accept, and celebrate those differences.” Professor Joseph and I took that as the starting point of our conversation. You can find out more about the work of the Center for Communication, Difference, and Equity at their website. Professor Joseph is working on her second book, Speaking Back to Screens: How Black Women on Television Resist PostIdentity Culture, an examination of African American women in modern television. For more about the work Professor Ralina Joseph is doing, go to her website. Our next interview, scheduled to coincide another upcoming lecture that is part of the UW’ Equity and Difference Series, will be with Professor Mehnaz Afridi of Manhattan College. She will be talking about Freedom, Religion and Racism in Jewish-Muslim Encounters. Steve Scher talks to producer, actor and activist Kathy Najimy about women and body image. Powerful forces are at work shaping our body image. Self-esteem, family norms, peer group pressures and the media all influence our feelings about our own bodies. Actor, activist and producer Kathy Najimy wrapped up the UW’s Weight and Wellness lecture series with a talk on “Women and Body Image,” based on her personal story and her years working in Hollywood. Named one of Ms. Magazine's 'Women of the Year’ in 2004, she is producing a new HBO series based on Ms. Magazine and the work of Gloria Steinem and the feminists of the 70’s. In the 80’s, she co-wrote and co-starred with Mo Gaffney in the Obie award winning feminist comedy hit, “The Kathy and Mo Show.” Two productions were later broadcast on HBO. Kathy Najimy’s breakthrough role was as Sister Mary Patrick in the 1992 Whoopi Goldberg film, “Sister Act.” She has gone on to a highly successful career on stage, screen and television in a wide variety of roles. For 14 seasons she was the voice of Peggy Hill on the award winning animated series “King of The Hill.” She co-starred with her idol Bette Midler in the movie “Hocus Pocus.” She was back on the New York stage in 2014 with her one-woman show, “Lift Up Your Skirt.” She is currently on HBO's "Veep," and has been cast in a new TV series as a police chief. She has spoken around the world on issues affecting girls, women, LGBTQ, as well as animal rights and AIDS prevention. She has won numerous awards and raised hundreds of thousands of dollars. She earned some of the money as a formidable TV game show player and as a poker champion. Support for At Length with Steve Scher comes from the UWAA. We swim in a sea of chemicals. Some of them are harming our environment, some are harming us. In part two of Steve Scher's conversation with scientist Bruce Blumberg, we hear more about the science of hormone disrupting chemicals, what action the regulatory agencies are taking and whether an approach called green chemistry could keep suspect chemicals from ever entering the environment. Professor Bruce Blumberg spoke at the University of Washington in May 2015, part of the Weight and Wellness series at the UW. Find more interviews on iTunes and Stitcher and at here too. Support for At Length with Steve Scher comes from the University of Washington Alumni Association. and the UW Graduate School. Steve Scher talks with Professor Bruce Blumberg about obesogens, hormone disrupting chemicals that seem to change human metabolism. We eat too much. We eat too much processed foods high in calories. We don’t exercise enough. It is being called an obesity epidemic, and it is putting more and more people at risk for heart disease, diabetes, cancer and other conditions at ever greater numbers around the world. But something more than our own actions seems to be at work resetting our bodies systems that regulate weight gain and loss. Bruce Blumberg, a developmental biologist and a molecular endocrinologist, coined the term 'obesogens' in 2006 after he discovered that exposing pregnant mice to a chemical compound call Tributyltin made their offspring heavier than those not exposed-- even when they are on a normal diet. His lab is at the University of California, Irvine. Scientists now know that fat tissue acts as an endocrine organ, releasing hormones related to appetite and metabolism. A rising number of manufactured chemicals bind to the same receptors as the hormones and either prevent proper actions by hormones or activate them in the wrong place and the wrong time. These Chemical “obesogens” may alter human metabolism and predispose some people to gain weight. Dr. Ellen Schur talks to Steve Scher about our bodies internal regulatory systems and how they change as we gain weight. She says the body's changes mean that simply exercising more and eating less is not the only factor to consider when we try to lose weight. Obesity is medically defined through the body mass index – BMI- an indirect measure of how much body fat a person carries. BMI is your weight in kilograms over your height in meters. Though Dr. Ellen Schur says it’s somewhat arbitrary and is dependent on the person, the cut off for obesity is a BMI of 30. Overweight is 25-29, normal weight 18 and half to 20. Dr. Schur is Associate Professor of Medicine in the Division of General Internal Medicine, University of Washington, Co-Director, UW Medicine Weight Loss Management Program. She is part of the UW’s Weight and Wellness Lecture Series spring, 2015. When people are in the overweight category, are they showing signs of changes that affect health? Are the blood sugars starting rise, is blood pressure starting to rise? Is the body weight tending to settle in the persons middle rather than in the hips or extremities? Any of these factors, in combination with a body mass that’s in the overweight range, puts people at higher risk for various disorders. Losing some weight is recommended. At this point, the connection between weight and wellness is pretty clear, according to Dr. Ellen Schur, Once we get obese, our body's internal regulatory systems change and it is going to take a lot more than simply exercising more and eating less to stay healthy. The newest thinking among medical specialists is that obesity is a disease and we need to treat it the way we treat other diseases. Just as with high blood pressure, doctors don’t expect a person’s will power will bring their weight down. At the point when we are overweight, all sorts of interventions are necessary, including permanent changes to lifestyle habits and medications. Sonia Nazario, author of “Enrique’s Journey: the story of a boy’s dangerous odyssey to reunite with his mother” talks to Steve Scher about the plight of one of the tens of thousands of unaccompanied minors who illegally cross Mexico by freight train and then the U.S. border in order to reunite with their families in the U.S.
She spoke to Seattle area audiences April 2015, about America’s Immigration Dilemma and the policies that might help these families. Tens of thousands of Central American children, unaccompanied by parents or other adults are hopping freights and fleeing the drug cartels, the gangs and the thuggish police in Guatemala, Honduras and El Salvador. Almost 50 thousand arrived by the middle of the summer of 2014, when the surge captured media and political attention. These children are often robbed, raped, beaten or kidnapped along the way. Thousands are detained in detention cells for months before their fate- often deportation is determined. There are at least 5 holding facilities in the Puget Sound Area alone. Though this story exploded onto the public mind last year, it has been a humanitarian crisis for years. Journalist Sonia Nazario won a Pulitzer Prize for her LA Times coverage in 2003 for “Enrique’s Journey,” a Honduran boy’s search for his mother who emigrated to the U.S. It became a best selling book in 2006. In 2014, her book gathered attention again, as the rising flood of young children peaked at about 60 thousand by the end of the year. Numbers are lower in 2015, as the U.S. has paid Mexico interdict the migrants before they reach our border. However the violence, criminality and chaos these children are fleeing has continued unabated. Sonia Nazario’s book is assigned in schools and universities around the world. She speaks to organizations and communities about the difficult journey, the hard conditions these young people are fleeing and the need to at least provide them with legal representation at immigration hearings. For more information about KIND and about Sonia Nazario as well as the other guest speakers visiting the UW, search for UW Alumni Association. You can also find us on iTunes and Stitcher. Dr. Regina Benjamin, 18th Surgeon General of the United States, talks with Steve Scher about bringing joy to efforts at losing weight and staying healthy. She spoke in Seattle as part of the UW's Weight and Wellness Series of Lectures. Dr. Regina Benjamin, Surgeon General from 2009-2013 says we have to rediscover the joy in being healthy. As Surgeon General, Dr. Regina Benjamin tried to find ways to remove the barriers to exercise. That included getting hairdressers involved in thinking about the most exercise friendly hairstyle. It meant starting a get out and walk campaign. Dr. Benjamin was the 18th Surgeon General, with the rank of a three star admiral. She is the recipient of numerous awards, honorary degrees. She started and continues to run a primary care clinic in Bayou La Batre, a small fishing community in Louisiana. She currently holds the endowed chair in public health at Xavier University. She is a member of the Institute of Medicine, the first physician under age 40 and the first African-American woman to be elected to the American Medical Association Board of Trustees. She is a Macarthur Genius grantee. She is also wonderfully down to earth, the kind of person you’d imagine as your primary care doc, friendly, helpful, non-judgmental. Dr. Benjamin's talk was sponsored in part by the UW School of Public Health, the UW Alumni Association and The UW Graduate School. "Obesity and Poverty: Linking Food, Health and Incomes"
Steve Scher talks with Dr. Adam Drewnowski about the links between obesity and poverty. Simply put, people with more money can pay for better food. But people with an attitude researchers are calling 'nutritional resilience' manage to put together a good diet at low cost. So, how can those strategies for eating better on less money spread to the rest of the population? Two-Thirds of Americans are overweight or obese. The NIH has found that "in contrast to international trends, people in America who live in the most poverty-dense counties are those most prone to obesity." That puts them at greater risk of diabetes and heart disease. Dr. Adam Drewnowski says that while food choices are based on taste, cost and convenience, there is a growing body of evidence that obesity in America is largely an economic issue. Policies that address access or behavior alone are inadequate. Disparities in health follow disparities in income. For example, UW researchers observed higher obesity rates along the I-5 corridor compared with a leaner population living along the waterfront. Shoppers at Whole Foods are likely leaner than shoppers at Safeway. Both stores offer a variety of food choices. What is happening? Given the results, what are the tools citizens can use to create healthier eating patterns? Adam Drewnowski is world renowned for his research into diet and social inequality, food taste and food preference, for studies on genetic food taste markers and the roles of sugar, salt and fat on food preferences and food cravings. His studies on taste, cost and convenience have spanned his almost 30 years in this discipline. He spoke at the UW's Wellness and Weight Lecture Series April 14, 2015 in the talk, "Obesity and Poverty: Linking Food, Health and Incomes." The Obesity Epidemic Around The World. Steve Scher talks with obesity epidemic scholar Shiriki Kumanyika about giving people the tools to understand the health implications of their personal choices. There is an obesity epidemic in America and it is spreading around the world, according the World Health Organization. Most of the world population now lives in countries where overweight and obesity kills more people than underweight. The Centers for Disease Control says about one third of Adult Americans are obese. Those rates are higher in the black community. Half of African-American women are obese. Worldwide, obesity has doubled since 1980, according to World Health Organization and 42 million children under 5 were overweight or obese in 2013. In America, obesity is more common among black women than white women. That has been true for decades. However, it is now more common among black girls than white girls. What is happening? Shiriki Kumanyika is a scholar in the field of nutrition and public health. She is currently president of the American Public Health Association, a non profit focused around the goal of raising health outcomes in America. Obesity leads to higher risk of heart disease, stroke, diabetes, osteoarthritis and some cancers. The causes are people eating more foods high in fat, more sedentary lifestyles and physical conditions-bad air, poor urban design, high stress. Kumanyika, a name she adopted to reflect her African roots, was born and raised in racially segregated Baltimore, Maryland in the 50's and 60's. After spending some time in social work, she found the tools of nutrition gave her a more concrete way to help. She studied the affect of salt on hypertension and by the 70's was among a number of science researchers arguing for a reduction of salt in the American diet. At Johns Hopkins University, her work as a cardiovascular/nutritional epidemiologist led her to study health disparities in general and the impact of obesity on black women in particular. Her work on the obesity epidemic is focused on efforts that lead black women towards positive changes in their diet. Michael Pollan talks with Steve Scher about our national eating disorder. Michael Pollan has helped move food issues toward the center of American politics. His books and articles have focused on how the foods we eat shape our health, environment and culture. He recently co-authored an article, with Mark Bittman and others, calling for a national food policy that could bring about fairer wages, healthier citizens and a more sustainable environmental future. April 8th, Michael Pollan is kicking off the UW's Weight and Wellness series with a talk entitled "Our National Eating Disorder." The event is sold out, but there may be stand-by tickets. The Weight and Wellness Series is supported by The UW Alumni Association and The UW Graduate School. Steve Scher talks with renowned choreographer Mark Morris, who was raised in Seattle and returns in March presenting a performance with his dance group and a talk at the UW. Mark Morris is one of the most highly regarded arists of our era. The Macarthur fellow is an innovator, a satirist and a romantic. He is most of all, a choreographer suffused with music. Steve Scher talks to former SETI DirectorJill Tarter about the search for life in the universe. Are we alone in the universe? That question drives SETI, the search for extraterrestrial intelligence. Jill Tarter has been on the hunt for decades. She currently holds the Bernard M. Oliver Chair for SETI Research at the SETI Institute in Mountain View, California. She is speaking at the University of Washington March 3rd. Humans have been wondering about other life in the universe for millennia. Scientists can actually seek the answer now. New tools have given astronomers, astrophysicists, exo-biologists the opportunity to scan the heavens for a signal from out there. Steve Scher talks to Christoph Bode about future narratives. Story creates culture, illuminates morality and explores mortality. Stories have rules that transcend different societies and languages. Christoph Bode is a scholar of the story and a student of the emerging changes in narrative structure. Christoph Bode is focused on story. Not necessarily any one story in particular, but rather how stories are created and constructed- by storytellers, by writers, filmmakers, even politicians. Bode is a professor of Modern English Literature at LMU Munich, one of Europe’s leading universities. How important is the study of story? He recently received a grant from the EU to explore how stories shape social and even political thinking. Christoph Bode was a guest of the University of Washington where he spoke on the emergence of digital, multi-player and other new approaches to storytelling. What do Disneyland, LA Freeways and Film Noir have in common? According to historian Eric Avila, they all represent aspects of America’s racial divide. Eric Avila is a professor of history at UCLA. He examines the built environment for clues to American values, prejudice and racial discrimination. His work takes him from Coney Island to the Freeway boom of the 60’s and on to Disneyland. Avila is in Seattle for a talk at UW titled, “Chocolate Cities and Vanilla Suburbs: Race, Space and American Culture After World War II” January 27th at 6:30 at Kane Hall, room 120. At Length is supported by the UW Alumni Association.